Seeds sleeping away the winter on the back deck. Some of these will go in the White Garden, some will end up in containers and some plants will go into the new mixed border off the back deck. Meanwhile the Hosta seedlings that I sowed back on December 19th have germinated and are growing under lights in the spare room in the basement. I had to clean that room out and set up an area where I could put a table and a four foot light stand. Here's what they looks like. The first photo is of seeds from Hosta 'William Lachman' x OP (open pollinated). There are lots of streakers and interesting looking seedlings in this flat. The second picture is a flat of seedlings from Hosta 'Epsom Derby' x OP. This one also has a number of streaked seedlings as well as some seedlings that look gold or blue. The streakers may stay that way or they may stabilize in subsequent years to variegated plants or solid color plants. All in all I've got about 100+ Hosta seedlings right now. Once they develop two or three leaves each, I'll move them into little 3 oz cups. At that time I'll cull some of the seedlings that are all green or look uninteresting to me. I've got a couple of small seedling beds in back of the deck that will house these and I plan to make another seedling bed in the holding area next year. I'll grow these on and we'll see what we come up with. Maybe a new named Hosta cultivar! Last year I did a little bit of Winter Sowing. Just some Petunias and some Hosta (Dorothy Benedict x OP). 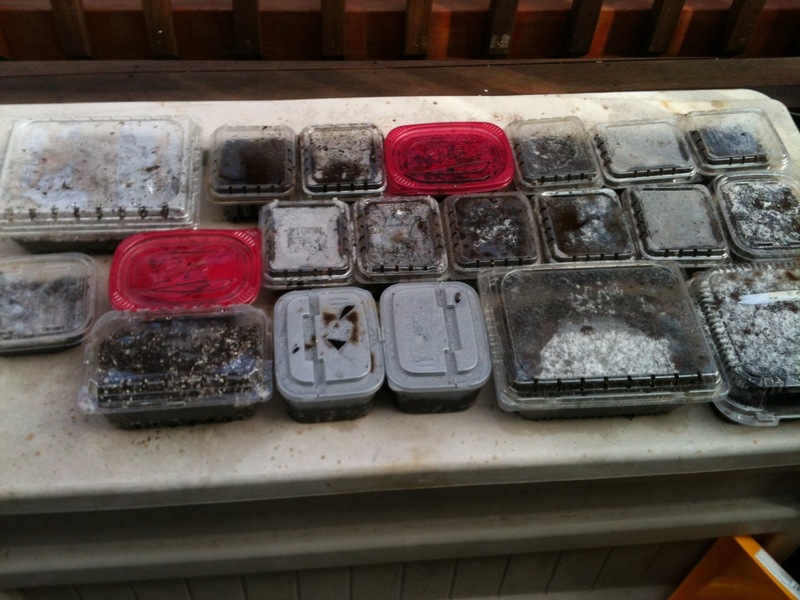 Winter Sowing involves planting seeds in small transparent plastic flats and putting them outside for the Winter. In the Spring you get some nice tiny little plants. I had some success with this and I will do it again for Annuals that I want for next Spring. My goal this year is to look to get some streaked Hostas that I can use for breeding my own plants. I got two Streakers from the DBxOP seeds last year. I hope to get about 30% streaked Hostas (that's the average) from these seeds. Plus I'll keep anything that looks architecturally interesting to me out of this group. I've sown about 30 seeds per package, except for the seeds from Rick of which I sowed about double that. It will keep me busy during the Winter months keeping these seedlings going. I've also planted two different Hippeastrum (aka Amaryllis) and some Paperwhite Narcissus for indoor plants this winter. Here's a pic of Hippeastrum 'Charisma' which just bloomed today. With the mild temperatures this December, the ground is not frozen anywhere on my property. This has given me the opportunity to continue to develop a few beds that I will plant next Spring. Yesterday I actually planted 6 Allium Gigantum bulbs in the daylily bed. These were 75% off at HD and thus I paid 60 cents for bulbs that usually cost several dollars each. These went into the ground with no problem. Mostly, however, I have been working on the soil prep for what I will call the Deck Bed. This is an area off of the deck that used to be a monstrosity of an above ground pool. The soil in this area consists of about 2 inches of sand below which is at least a foot of compacted clay and gravel. After having thousands of gallons of water sitting on top of this area for many years, the soil is heavily compacted. It has taken me about a week of tilling and digging to get the soil loosened enough for it to drain. This is an area that is a circle 28 feet in diameter so I can't make enough compost to cover it. I'm going to have to truck in some 50/50 (compost/topsoil) from a local dairy farm in order to give the soil the proper amount of organic matter. I dug out this boulder earlier this week. This thing weighs at least as much as I do (about 200 lbs) and it was 3 feet below ground. It took me two days with a 6 foot steel digging bar to get it out of the ground and place it in the garden in a way that would be attractive. I ran into another boulder this morning. Unfortunately this one is about 3 feet wide by 4 feet long and must weigh thousands of pounds. At one point it is only about 6 inches below grade. I'm not sure what to do about this but it's clear that it is not going anywhere. Here's a picture of the Deck Garden taken late this afternoon. The large boulder is at about 8 o'clock as you look at the circle. The boulder in the pic about is at about 9:30. This garden is going to be a mixed border of shrubs and perennials. In the growing months it gets almost full sun, so there won't be any Hosta. At least not until we grown some shade. I plan to plant a Stewartia Pseudocamelia tree somewhere in this circle that will eventually make some shade. The idea is that this garden will create a separation visually that will divide the deck area from the back Hosta gardens. It's going to be right off the deck so it will be the first thing you see coming out of the back door. This will be my major project for next year. Most of November is cleanup and there certainly is a lot to do in that area, as I still have distressed trees that need to be trimmed or in some cases removed. But another task is to prepare beds for planting next Spring. Today I did that by the fence, as I am putting in a privacy screen of five Arborvitae (Thuja Orientalis 'Emerald Green'. These are narrow columnar shaped Arborvitae. They will grow about 3 feet wide and 12 feet high in about 10 years. The plants I bought were half price at HD last month and they are wintering over in a holding area in pots that are sunk in the ground. They are about 5 feet high so they have some growing to do. I'm building a mound about a foot high by the fence in which to plant them so that they will be taller sooner. First I had to kill the grass in this area. Since I wasn't planting until Spring I decided not to use Roundup, but to use a chemical free method. I place flattened cardboard and layers of newspaper in the planting bed. This was after I used string and lime to line out the area and then removed the grass along the edge of the bed. The cardboard newspaper barrier will eventually break down and decompose. But not until the grass beneath has been killed due to lack of light. I took some soil from an area on the west side of the property. This soil looks like it was stored there for many years in a pile. It's full of roots and weeds, but I'm sifting it before bringing it over to build the mound. I'll add some organic material to this area as well as soil. By the Springtime it should be all set to move the Arborvitae without the use of herbicide. I have another bed to prep this fall, but I don't know if I will get to it as there is so much cleanup to do. We'll see. The October Nor'easter notwithstanding, I haven't stopped purchasing or planting. Yesterday I put in 75 daffodils (Ice Follies) in the driveway bed. These were the bulbs that were a replacement order from last year. Eden sent me an extra 25 bulbs due to the fact that they sent me the wrong bulbs last year. I had to remove some snow from the bed, but the soil was nice and diggable as I used a bulb planter to put these in. The work went quickly. Today I went to Weston Nurseries because their end of year sale was too good to pass up. I picked up a Viburnum 'Cardinal Candy', a Hydrangea 'Bella Ana', and Cornus Sericea 'Silver and Gold' along with a few tulips that I will force by bringing them into the house in the winter time. Here's a pic of Cornus Sericea 'Silver and Gold'. This is a plant I've been looking for for a long time. It's actually a red twig dogwood, but the branches are a gold color instead of red. 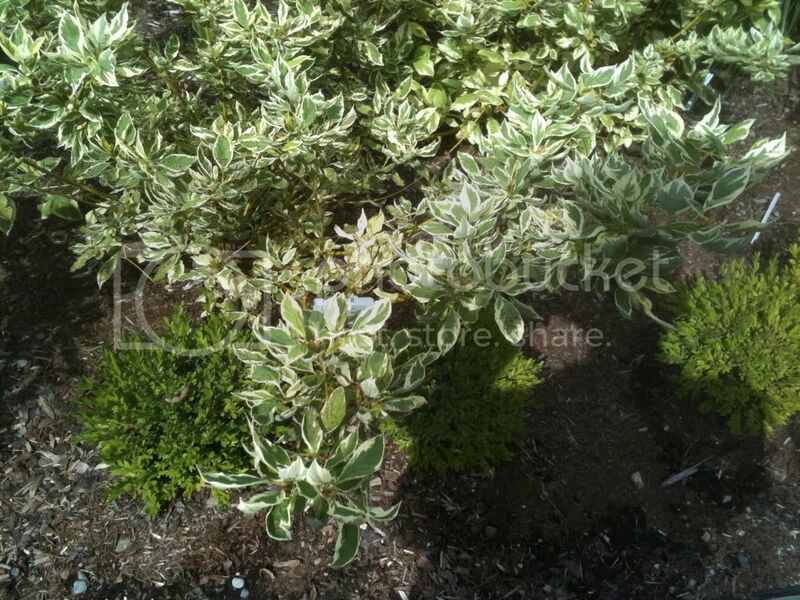 As you can see from the picture it also has variegated foliage. It also grows golden colored berries that the birds go crazy for. So it's a 4 season shrub. Right now I've put all these purchases in a holding area, but I already know where Silver and Gold will go. It will be placed on the hill in the back garden to provide some protection from the afternoon sun for the Hosta in that bed. This is an old fashioned shrub that you see a lot in older gardens, but it's hard to find in nurseries. Nurseries want to sell the latest and greatest stuff and oldies, but goodies like Silver and Gold get crowded out. At half price I couldn't pass this one up. Here's what mine looks like right now. I've been accepted into the Master Gardener's program by the Mass Horticultural Society. In order to become a Master Gardener you have to take a full course in Horticulture, pass a test and then volunteer so many hours in different areas. This is something I am looking forward to. The course begins in February and runs through next Spring. It should expand my knowledge a great deal. October 30th is my anniversary. 35 years. Unfortunately dinner and movie plans were cancelled, since we were in the middle of a nasty Nor'easter. We ended up with a foot of heavy wet snow. It fell on the trees and shrubs that were full of leaves. The result was that many trees suffered broken branches. Most of the Oaks dropped large branches on the Hosta gardens. 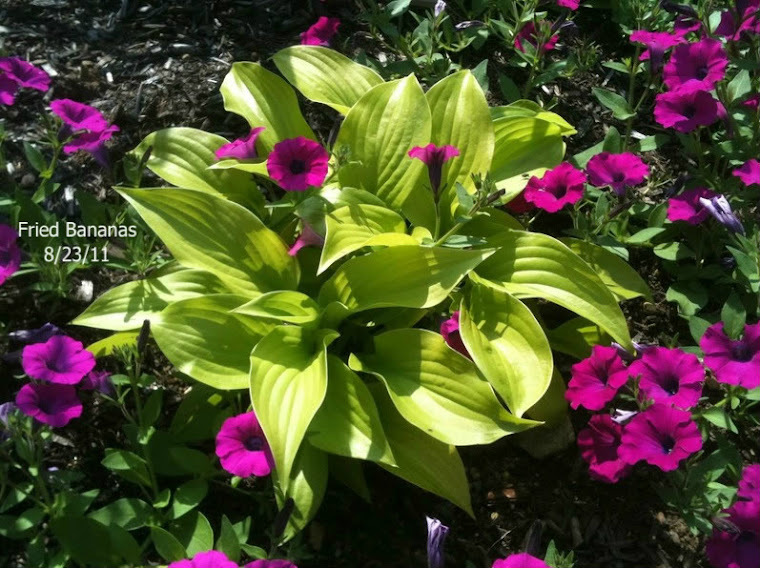 The Hostas won't be affected. They were pretty much done for the season. But there's a lot of cleanup to do. The large JM in the front lost several large branches, but it still looks OK. Many of the lilacs were bent over to the ground but they responded when I cleaned off the snow. 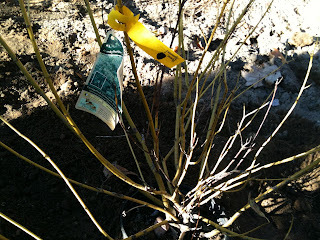 The large Rose of Sharon in the White Garden was flattened to the ground. I'm hoping it will bounce back, but it may need significant pruning to restore it. Other trees and shrubs have responded well to being cleaned up. We will have a lot of branches to chip later in November and a lot of chainsaw work to do. Well the first frost we had was accompanied by ice and about a half inch of snow over all the grassy surfaces. Even the roads became icy last night as this morning's commute was full of accidents. The Hostas seemed to survive OK, the New Guinea Impatiens melted as I expected. More snow due tomorrow night, a Nor'easter with 5 plus inches predicted along with strong winds. Hmm. That's should put things into dormancy. 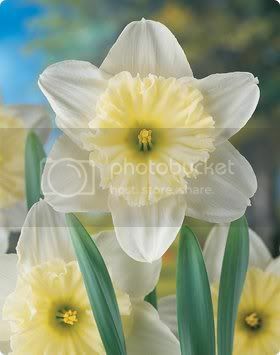 Finally got the replacement daffodil bulbs from Eden Brothers. They sent me an additional 75 Ice Follies daffodils as a means of making up for their mistake last year. That means I have 125 bulbs to plant this Fall. I hope that snow melts soon, so that I can get these in the ground. Here's what it looks like.